Have you been wanting to get a furry companion to your first fur kid but thought that dogs and cats were mortal enemies? I love Ghostbusters, but I’m happy to say, Peter Venkman is wrong. Cats and dogs live together quite happily and form lasting bonds of friendship. Sage is my patriarch. At 19 years old he really does do whatever he feels like. While the dogs have to display their best manners when we’re eating dinner, Sage just comes right up and inspects the plate. And gets a handout. Don’t judge. He’s 19. When a kitty reaches that age in my house he’s earned extra special treatment. And a taste of chicken. Or bacon. Especially bacon. Sage is also the unquestioned ruler of the couch, the pillows, the dog beds and even the dogs. It all started, well, 19 years ago. I brought Sage home as tiny kitten and my Belgian sheepdog, Pagan immediately appointed himself Kitten Guard and Personal Groomer. Sage learned from the very beginning that dogs will comfort you, clean you and cuddle you. That’s pretty much been his expectation with every other dog in my house. Of course from Sage’s point of view, they’re his dogs. Nothing like a warm, soft dog pillow on those frosty winter nights. In Sage’s world, dogs must be cuddled and dogs must be cleaned. Dogs and cats can experience stress, fear and anxiety when they are all alone in our homes. Having another furry friend eliminates this. Bringing in a second pet, while ultimately rewarding for you and your current fur kid, will require some effort on your part to ensure a smooth integration into the family. Think about how your pet reacts right now to other animals or visitors in your home. If you have a dog, do they enjoy other dogs? How do they react when they see another animal? With excitement? Interest? Or fear? Have you had other animals in your home? Consider a trial run if your pet has never seen another dog or cat and you’re thinking of expanding your household. Enlist a friend to bring their (well-socialized!) pet over for a visit – for a few hours or even volunteer to pet sit for a day or two to get your fur kid used to the idea of other animals in the house. As you can see from my household, I have pets in multiples. They keep each other company while my husband and I are at our day jobs. Indeed, most pets will benefit from having a full-time friend. It can help reduce anxiety and loneliness. Of course before you bring in a second (or third!) pet be sure you can devote the time, energy and finances to giving your new fur kid the same love and attention as the first. Do you have a single fur kid? Have you thought about adding another but weren’t sure it would work? 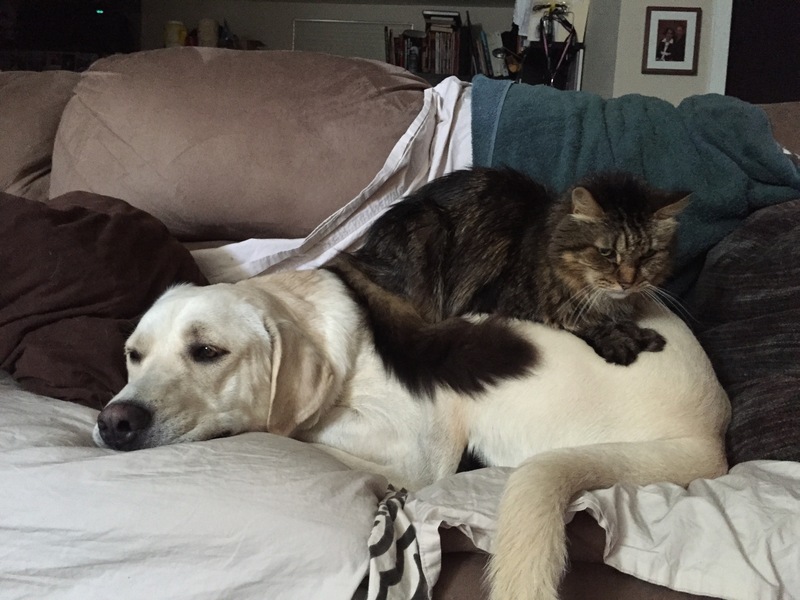 Tell me how your fur kids get along! 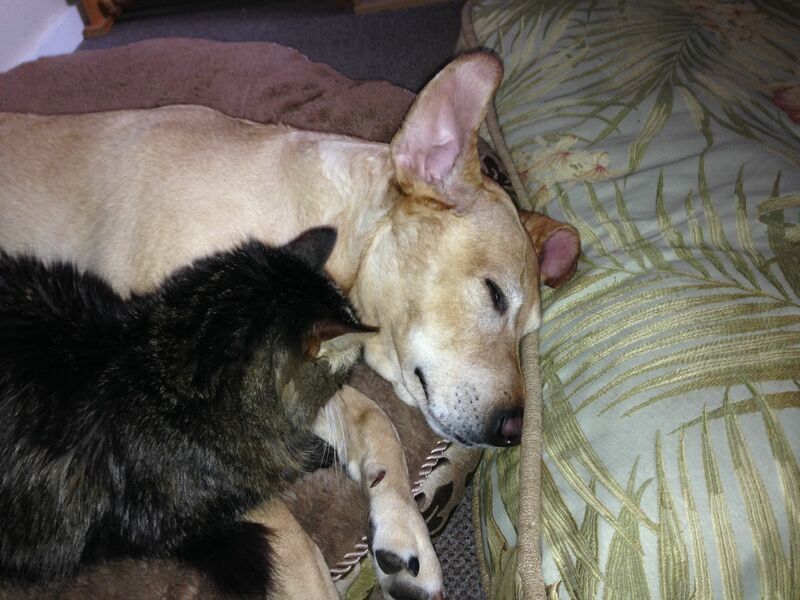 And take a look at this adorable compilation of dog-cat buddies.